A home library is probably the hub of literature, knowledge and wisdom stored in one room of a house. Your home library is the place where your love for books and thirst for knowledge is stored. You can store your book collection in any one of the below-listed ways. 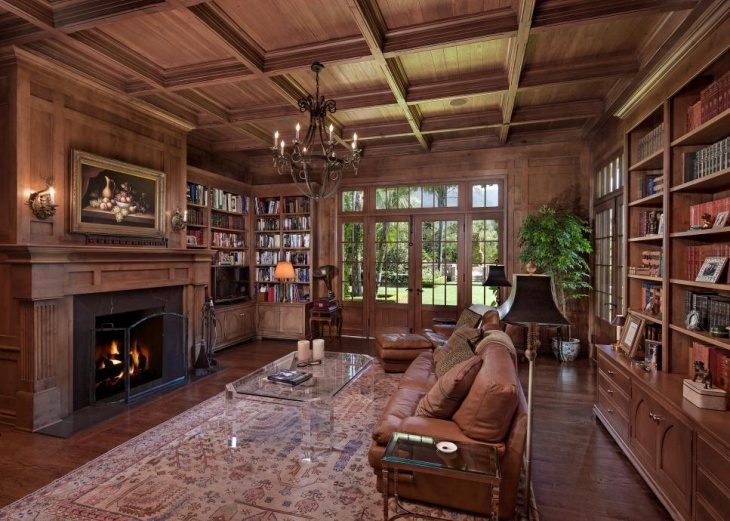 Following are some of the classy living room library designs we have collected. This elegant living room library design has a complete wooden décor in a rich color that adds to the rustic look and feel of this space. It also features a cozy fireplace to curl up while enjoying a cuppa in one hand and book in the other. This black and white living room library features wall to wall bookshelves that are the backdrop of this large and spacious home library. The black couch provides a warm and comfy spot to spend time reading your favorite book. 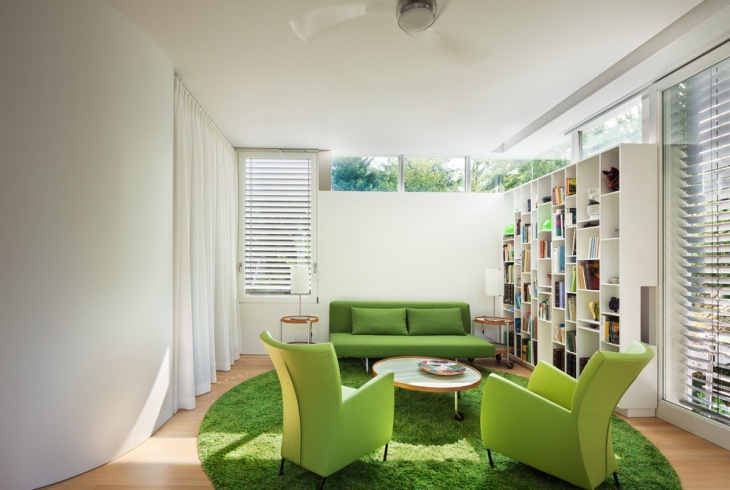 This gorgeous home library has a colorful theme of white and bright green which has a built in wall bookshelf wherein the books are stored. It also features two individual comfortable armchairs in green that complement well with the green rug placed in the center. This unique living room library has an open library with broad but not more than three slabs for placing books. It also has additional modern bookshelves around the fireplace that lighten up the mood for reading a book or two in a cozy feel. This small living room library is colorful, funky and functional. With gray sofas paired with pink and white striped cushions, a built in book shelf that is high above and a dual reading lamp, it provides a comfortable reading ambiance. 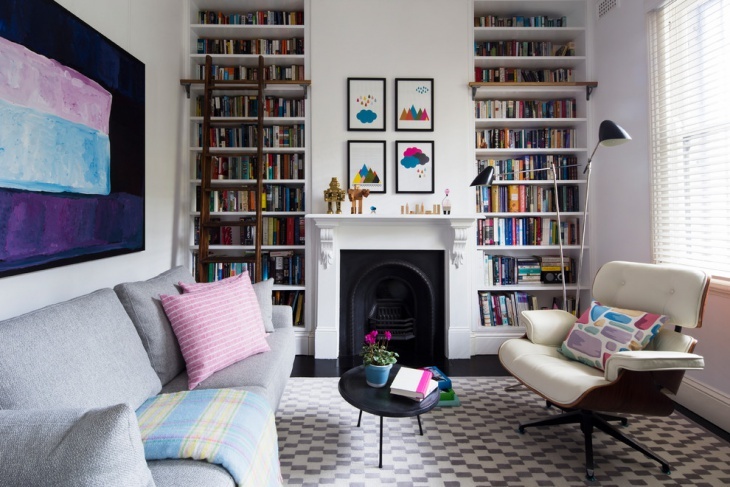 This modern living room library is designed to reflect simplicity. It features built-in shelves in black and also has a small ladder to reach out the books that are placed on the top. It also has the modern teakwood armchairs for relaxing and reading books. This bright and colorful home library features in-wall shelves that are painted in bright neon. The dark wooden flooring complements well with the white sofas and the white drawers just below the shelves alongside a gray rug in the middle. 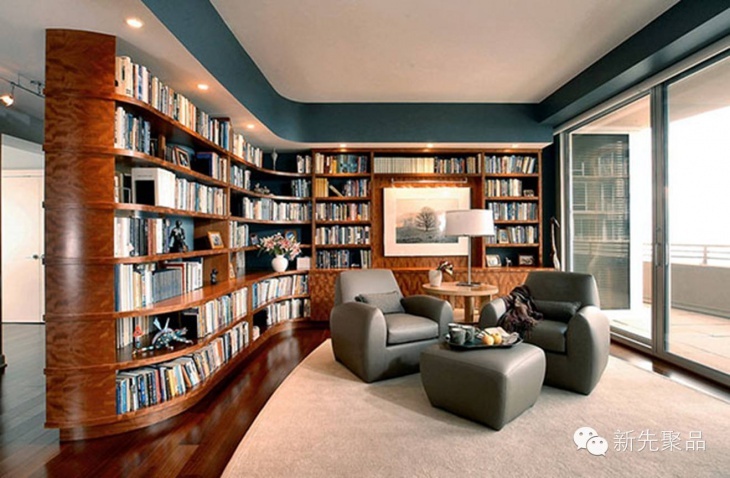 This contemporary living room library features trendy curved wooden bookshelves which are large and spacious enough to store a number of books. The gray leather couches and the teal ceiling wall makes for a luxurious living room library alongside another décor. 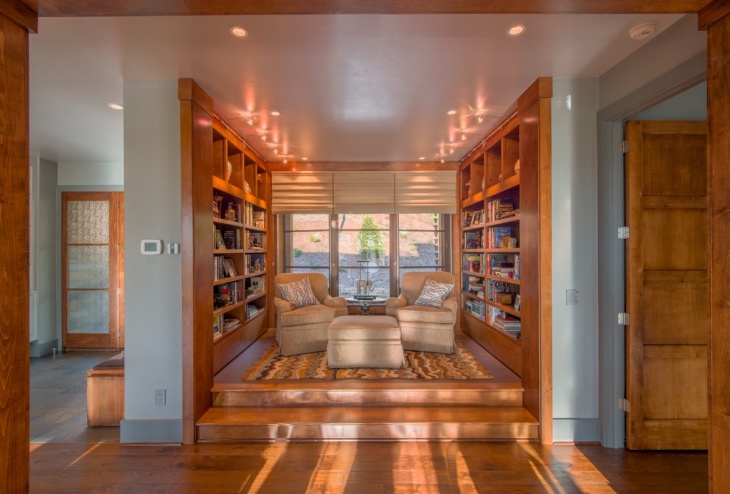 This traditional living room library features built in shelves to store books. This is more of a jazzy kind of living room where all the décor is integrated into one room. 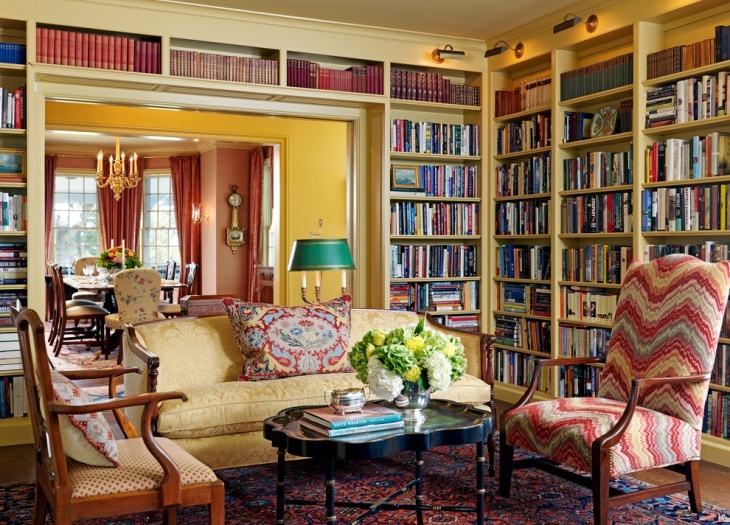 It features a large sofa and two armchairs and various colors are incorporated in this traditional living room library. 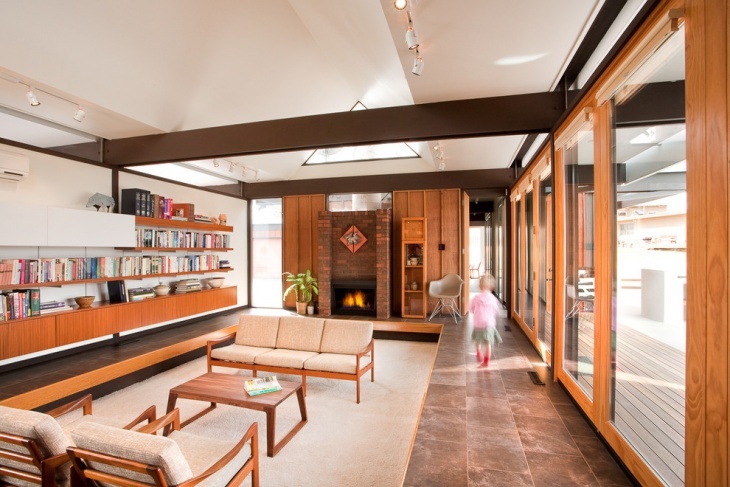 Well, no matter how your house is designed – traditional, contemporary or a mix of both. You can always look up for the above ideas to incorporate the designs of bookshelves, couches, wall colors etc. in your living room library to make it a more functional, comfortable and cozy one.